“In this Special Issue of Frontiers, we have assembled pioneering examples of the quantification of ecosystem services and nascent steps toward turning that quantification into a framework for better land and water management,” Kareiva and Ruffo write. 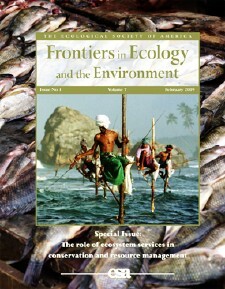 The issue’s authors draw on current ecosystem services projects ranging from ranches in the Everglades to North American shorelines to cultural lands in Hawaii. Novel programs such as the Florida Ranchlands Environmental Services Project (FRES) are designed to encourage the provisioning of ecosystem services from agricultural lands. These initiatives differ from traditional cost-sharing programs by paying landowners directly for the services their lands already provide, instead of giving incentives to adopt additional practices. In the Florida Everglades, agriculture has increased nutrient runoff into the Lake Okeechobee watershed since the 1940s, which has caused harmful algal blooms and ocean dead zones. State agencies are now developing a program to pay ranchers for ecosystem services produced by their lands, like water storage and filtration. Another study shows that although wave attenuation, or the minimizing of ocean damage to shorelines by wetland habitats, provides quantifiable protection to coastal communities, this service can vary over time. Much like an economic market rises and falls with prosperous and hard times, these services vary over the winter and summer months, when shoreline plants are at different densities. The authors argue that most ecosystem services likely vary in a non-linear fashion, which will prove challenging for ecosystem modelers. Placing a dollar amount on ecosystem services is not the only way to value them, however. In Hawaii, researchers say, ecosystem services evaluations should take into account cultural values, such as access to spiritual lands and areas available for gathering traditional plants used in ceremonies. The authors use a new software modeling program called InVEST (Integrated Evaluation of Ecosystem Services and Trade-offs) to help land managers and government workers assess this wide array of services. The InVEST software has also shown that high levels of biodiversity often go hand-in-hand with the provision of more ecosystem services, suggesting that the preservation of biodiversity will enhance ecosystem services. This correlation is also reflected in the success of ecosystem service projects: The authors report that although conservation initiatives that focus on ecosystem services are still in their infancy, many are as successful as traditional biodiversity preservation approaches, and can often garner as much or more funding from the private sector.